The second in the trilogy of Asher's new-age compilation albums, Sketches of Innocence is predominantly made up of improvised piano sketches, some 'naked' as it were, and some lightly orchestrated. The melodies are playful, innocent and restful, and also very visual. There is a pastoral feel to the music, and, as so often in Asher's music, hints of the Celtic folk tradition as well as Jewish, Mediterranean, central European and Russian flourishes too. As with Concert of Angels, by the way, children seem enthralled by this music... it is very calming and freeing. 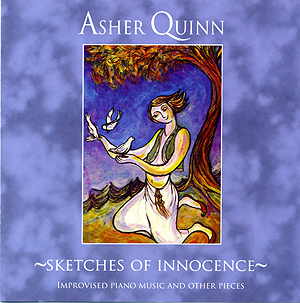 Those who think solo piano music is either solely for the lovers of either classical music or new age fluffery will be proven wrong upon listening to Asher Quinn's new compilation. While there are many elements of both in Quinn's playing, to paraphrase a cliche, Quinn's musical completeness is definitely much more than the sum of the parts. Quinn takes his classical keyboard background and adds a plethora of pop songcraft to create his varied compositions. While some might rightly say pop songwriters have often turned to classical music for inspiration, Quinn's compositions are different as they have a scope to them, which suggests Quinn uses classical as a mere jumping off point. That in itself is a very interesting quality to Quinn's music as although he is known as a new age/classical-styles musician, his musical roots delve deeper into rock and pop than most would assume because Quinn's very early childhood was filled with the sounds of pop music stars Buddy Holly, Rick Nelson, and Elvis Presley. As he grew older, acts like The Rolling Stones, Cliff Richard and The Beatles became his favourites, but above all, Quinn drew a lot of inspiration from Bob Dylan's lyrics. That Quinn can take inspiration from one of music's greatest lyricists and use that to fuel his own wordless, piano-driven compositions is to be able to fully grasp the musicality of pop and have the skill to transform it into his own musical vision. To say he has succeeded would be an understatement. While flying under the radar of those only concerned with the shallowest of pop music, Quinn is a music business veteran whose artistry has attracted a decent-sized following as he has amassed over a half million units sold of his dozen-plus albums beginning in 1987 when he made his recording debut under the name Denis Quinn. Eventually abandoning that name, Quinn released several albums under the name Asha before settling on his current moniker. Quinn has also managed to place several albums on the top of the New Age and Ambient charts around the world, a feat enviable to an artist, regardless of name. Seeing as he has mined the best work of his previous albums for it, there's no doubt this compilation album will also be popular among Quinn's fans. The first set of songs is entitled "Just Piano" and features Quinn solo. This set begins with 'Lydie', a very classical-sounding song which invokes an air of tenderness and gentleness as the melody gently rolls from Quinn's fingertips. It is followed by 'Silver Socks', which has a feeling of brightness about it, though the tempo remains very similar to the previous song. 'Mayflower' comes almost seamlessly from its predecessor, carrying much of the same vibe and warmth. 'Water Lilies' then increases the tempo and the intensity a bit, relying on the higher register of the piano for most of the melody to give the song more intensity, which is coupled with a slight synth background chorus as well. The next song, 'Gospel', has the expected feeling of a church hymn, majestic and passionate throughout. The song "Piano Moon" follows and the mood the song evokes is akin to the classical vibe of the first song along with a sort of darkness that makes the title seem very apt. 'Morning Tune' is not surprisingly very bright and upbeat, much like the time of day mentioned in the title of the song. It's a very joyous song even while somewhat restrained, much like the way a person walks when they first get out of bed. Quinn has captured a mood perfectly within his composition. 'Cool Water is a very gentle piece, the notes sometimes falling from his hands to the keyboards like drops of water dripping from a tree branch into a pond. 'Anthem' is next and is quickly followed by 'Xerokambos', two brief compositions which wind up the first section of the disc and pave the way for the second part which is entitled 'Lightly Toasted Piano'. The first song of this new section is entitled 'La Vie D'Un Oiseau', and contains a smattering of recorder played by Phil Thornton, who also remastered these tracks for release on this new CD by Quinn. 'Pale Star' comes next and features some light synth washes and other touches by Quinn, which serves to add a variety to the music missing in the first set of just solo piano pieces. With these touches, Quinn shows himself to be a decent arranger and shaper of sound. While the piano playing tends to be more basic and melodic in these songs, the other touches accentuate the melodies and make them resonate clearer and deeper than some of the earlier pieces. 'Islands' follows and features some of the same type of synth washes as does the following two songs 'Hiawatha' (which was formerly name "Princess" according to the liner notes of the CD) and 'A Tree Grows From The Heart', which wraps up the "Toasted Piano” section. Next up is the final section, entitled “Piano and Cake". The first song from this section is called 'Pixie' and features a different keyboard sound from Quinn than his usual piano. The texture is quite interesting, sounding somewhat like a kalimba. Quinn's next batch of songs pretty much follow the same pattern, with different keyboard sounds as played by Quinn with various instrumentation adding background textures, filling up the sound and bringing his compositions to fuller life than on his solo piano pieces. According to the CD liner notes, Quinn plays all instrumentation except the recorder, showing Quinn to be a formidable instrumentalist as well. This is an album for those who love piano music of the classical and new-age variety. Not sure how much of a "new audience" Quinn will pick up with this, though since it's a compilation of what he feels is his best piano work, there may be an interest from potential listeners who feel this may be a great entry point into Quinn's music. Though very comprehensive in scope, the only downfall is the lack of dynamics on the disc, which would not bother Quinn's regular listeners but may turn off potential fans who find the CD might sound a little too similar. Luckily, breaking the songs into three groups helps out with this. On the other hand, those who may already like Quinn and his work and simply want a conveniently programmed collection will know what to expect from an album of his solo piano music. Most interesting is according to Quinn's website, he has recently begun turning his attention to songs with vocals, specifically those written by other artists and has recently released a few albums in this new style. Since this is a compilation of his pre-vocal work, this CD may be Quinn's way of collecting what he feels is the best of his past as a way of summing up a portion of his career he has moved past. Either way, it is a decent album for a relaxing Sunday afternoon, and that's never a bad thing.